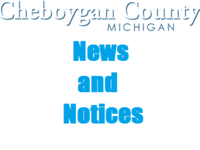 The May 1, 2019 Cheboygan County Planning Commission meeting has been canceled. The next regularly scheduled Planning Commission meeting will be held on May 15, 2019 at 7:00pm in the Commissioner's Room (#135) of the Cheboygan County Building. Comments and correspondence may be sent to the Planning & Zoning Department, PO Box 70, 870 S. Main, Rm. 103, Cheboygan, MI 49721. Cheboygan County is currently seeking bids for one truck - utilized to load and unload recycling roll off containers. Please click the link to find out more. Cheboygan County is accepting resumes and applications for a full-time Classroom Aide for the Straits Area Youth Promotion Academy (SAYPA). The Classroom Aide works with adjudicated youth assigned by the court to the program during the school day to help students remain focused during lessons and work assignments. The Classroom Aide assists the instructor by providing clerical support and reinforcing a positive classroom environment. Work performed under the general supervision of the SAYPA Director. Cheboygan County is seeking Request For Proposals to provide inmate phone service to the Cheboygan County Jail. For RFP Packet please click the link below. Straits Regional Ride is looking for a full time bus driver. Please click the link to find out more. Cheboygan County receives a portion of its revenue from the State of Michigan to provide services to the public through the State of Michigan’s County Incentive Program. The County is also required to submit an annual report to the State identifying the County's pension obligation costs. The following link provides information concerning Cheboygan County’s financial documents as required by the programs. To view the County of Cheboygan Annual Financial Report for 2017. The Board of Commissioners adopted the Cheboygan County 2019 Annual Budget at the December 11th, 2018 Commissioner Meeting. To access the complete budget document please click the following link. A true trails destination….over 5,300 miles of trails await you in Northern Michigan! 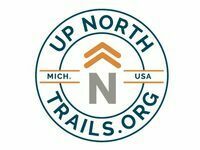 Whether you are a hiker, bicyclist, skier, horseback rider, ORVer, or snowmobiler, thousands of miles of trails await discovery Up North. Our vast network of trails is just a click away. Discover trails that suit your needs, read about the trail systems, view photos, and click on trail segments to find out even more. Don’t forget to light up Points of Interest and Nearby Trails to discover amazing things to see and do around your chosen trail! We hope you enjoy our new website and the variety of new features it offers. Finding information you need has never been easier thanks to our innovative new layout and design. In coming months, we will expand and enable more access to information about county departments, programs, functions and services. Explore, enjoy, stay tuned in and watch us grow! Cheboygan County, “Michigan’s Shoreline County” Containing miles of beautiful shores along the Straits of Mackinac, Lake Huron; The Inland Waterway, Burt Lake, Mullet Lake, Black Lake, Douglas Lake and dozens of additional inland lakes. 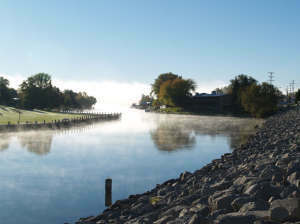 Cheboygan County is a great place to live and work, containing some of Michigan’s most visited tourist destinations and recreational assets as well as home to agricultural, health care, paper products, marine contracting, steel fabrication and hundreds of additional small businesses available to serve you. Cheboygan County was organized in 1853 with the first Courthouse being located at Duncan City, comprised of two townships. In 1860, the Board of Supervisors, then eight members, moved the County seat to Inverness Township. In 1868, the new Courthouse was constructed; the building still stands and is known as the Fifth Ward Hose House. In 1894, a new Courthouse was built at a cost of $30,000 located at the corner of Main and Court Streets. This building was razed in 1970. The present County Building was erected in 1968 at a cost of $985,000. In January 1980, the north-end addition to the County Building with 17,300 square feet was ready for occupancy. This addition housed the Cheboygan County Family Independence Agency until the fall of 1997. During 1998 this space was converted into a Phase I expansion for the County Jail, creating a 34-bed dormitory style lockup; four holding cells and administrative offices for all departments under the County Sheriff. During early 1999, the former County Jail was converted into additional jail cells for female inmates which was Phase II in the process. In 1983, Cheboygan County was apportioned into eleven Commissioner Districts, having been reduced from fifteen in the 1980 reapportionment process. Cheboygan County currently consists of seven Commissioner Districts, having been reduced from eleven to nine in the 1990 reapportionment process and from nine in the 2000 reapportionment process. The County has nineteen Townships, two Villages, Mackinaw and Wolverine, and the City of Cheboygan.